No one can deny the allure of Larnaka in the summer; beautiful beaches, outdoor sports, fantastic events and that general positive atmosphere that the sunshine brings with it! Naturally, the region has plenty to entertain and occupy you during the hot summer months whether you would like to go on a traditional fishing trip, play tennis on the beach, take your yoga out at sea or just dance till you drop at one of the many beach parties taking place this summer... phew! Aside from the fun activities on offer, the town recently hosted a mass wedding where love filled the air, and with the Larnaka fort now open on weekends, you will have more than enough to ensure a memorable summer in Larnaka. We also caught up with another member of the Larnaka Tourism Board who is part of the group of people who are passionate about Larnaka and dedicated to making it your number one destination time and time again. There will be no summer break from our efforts to enhance Larnaka, so as we continue to work hard to bring fresh, new initiatives to the region, all that remains is to wish you 'happy holidays'! The Larnaka Tourism Board recently held its 2nd Annual General Meeting and addresses were given by the Minister of Tourism and the CTO Chairman who both emphasized the region's broad appeal and diversity. LTB Chairman Mr. Dinos Lefkaritis' speech highlighted the strengths of the region which, thanks to all the projects in the pipeline made it "Larnaka's time now". During the Annual Meeting, the 2013 'Larnaka Awards' were given to easyJet and Kastela Beach. It is no secret that Larnaka is a romantic setting for a wedding under the sun, and 85 couples proved that its appeal is the same for love at any age during a mass wedding where the youngest couple were 18, and the oldest groom was 81! The happy couples arrived for their big day by ship to Larnaka Port were they were welcomed in a traditional way and were then officially wed at the romantic Medieval Castle Square. 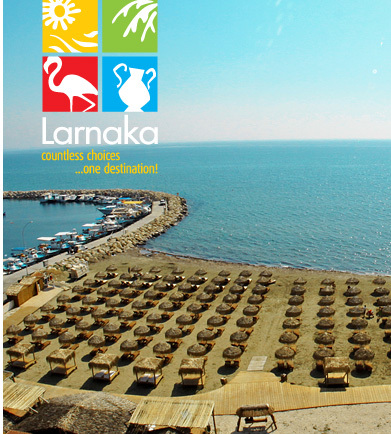 Win Fantastic Larnaka Prizes on our Facebook Page! The Larnaka Tourism Board will be running regular competitions through our Facebook page all throughout the summer, with some fantastic prizes to be won. All you have to do is 'like' our page and register for the competition to be in with the chance of winning hotel stays, mini cruises and passes to various attractions. Winners will be drawn every fortnight and the competition is open to everyone. We wish you the best of luck! Zygi Village boasts beautiful coastal scenery and a newly completed Fishing Reserve. Thanks to a recent initiative co-financed by the European Fisheries Fund, visitors can now experience the traditional fishing methods first-hand. The authentic fishing trips take place in a traditional fishing boat with the local fisherman casting their nets for the morning catch. As you explore the caves of the area, the tour guide will entertain you with stories of the sea and the history of fishing on the island. The LTB is comprised of a group of people who all have a passion for Larnaka and are committed to its ongoing enhancement, one of which is Joanna Florentiadou. Joanna loves how Larnaka is a perfect blend of 'east meets west' and says "what is there not to like about Larnaka - where the magical blue waters can have you daydreaming for hours...the breathtaking view of the Salt Lake with the flamingos swaying majestically, and the warm hearts of its people that keep this region constantly buzzing with life and laughter." Aside from the sports you can enjoy in and on the water at Larnaka’s excellent beaches, the sand also provides a challenging base for beach activities such as tennis and volleyball. The Larnaka Beach Tennis Club holds tournaments on the CTO beach in Pyla every Sunday throughout the summer and all players are welcome. Also, a permanent volleyball court and net have been erected on the sands of the Finikoudes beach, which are free for everyone to use. As one of the most historic sites in Larnaka, the Medieval Castle is a popular tourist attraction, as well as a beautiful setting for summer performances and weddings in its courtyards. The Department of Antiquities has recently amended the opening hours to include weekends, a welcome decision which will give more visitors the opportunity to experience this unique piece of history. The castle was built in 1625 and includes a small museum as well as original cannons and other weapons. Yoga on the beach is already a popular pastime on the island, but now there is a yoga class with a difference in Larnaka as you take your moves off the sand and into the sea, balancing atop a board! The SUP boards are giant surfboards, sturdy enough to support you and add an extra challenge and dimension to the yoga class, enhanced by the gentle lapping of the waves and the fresh sea breeze. The use of the paddle board is a great way to build muscle strength and improve balance. No summer could be complete without some great beach parties, and as a happening coastal town, Larnaka certainly delivers on this summer promise! The different beaches of the town will all be the scene of independent beach parties throughout the summer, including the island's current top hot-spot McKenzie, and the newly upgraded Kastela. 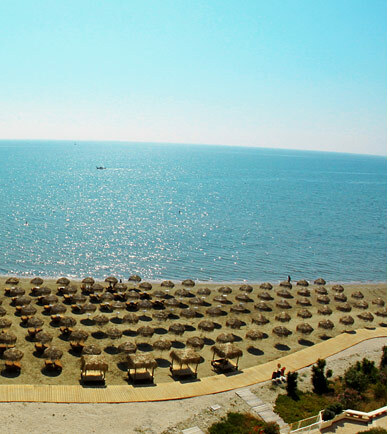 There will also be two official beach parties taking place in July at Finikoudes Beach and in August in Voroklini's Lenios Beach.